Q: What is veterinary Financial Officer? Q: What are the requirements to get veterinary Financial Officer? 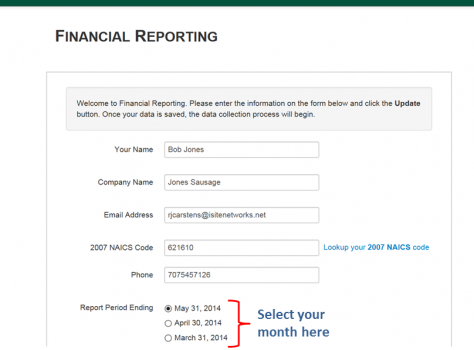 Q: Is the Mac OS X version of QuickBooks supported? Q: What versions of QuickBooks are supported? 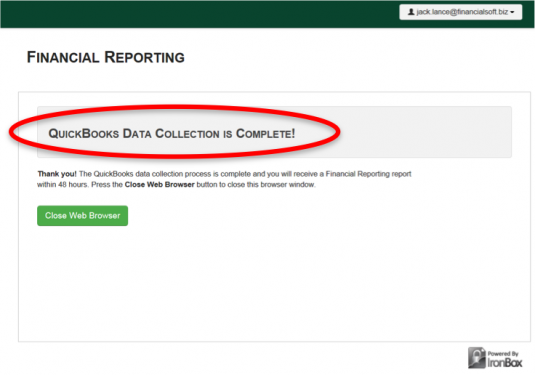 Q: I use QuickBooks “Online” — does veterinary Financial Officer support that version? Q: Our Company does not use QuickBooks. How can I get veterinary Financial Officer? 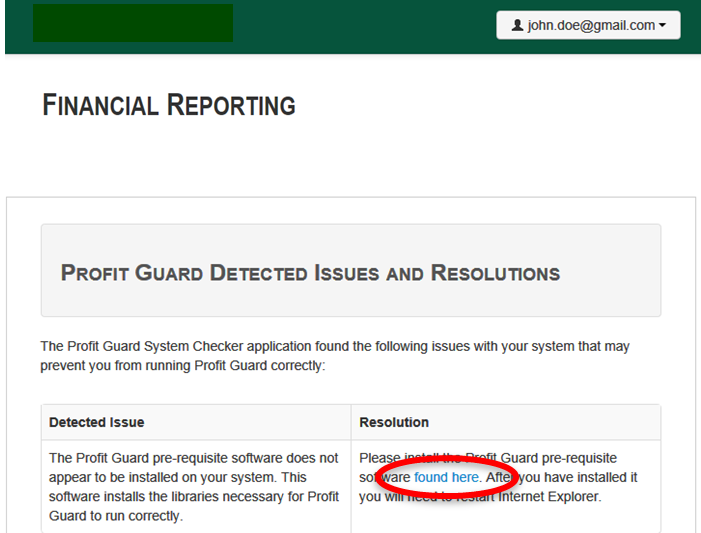 Q: In installing and running the veterinary Financial Officer software I get references to Profit Guard, BRS, Business Resources Services, apps.profitmastery… What are these? Q: I am not “financially trained” and have not taken any classes to learn about how my financial statements can help me improve my business results, can I still benefit from getting the FinancialSoft Reporting Tool? Q: How do I purchase the Product? Q: Why Monthly and not Quarterly? Q: What is the software that I am downloading and installing? Q: I cannot seem to install the software add-on without my computer Administrator Password. What do I do? 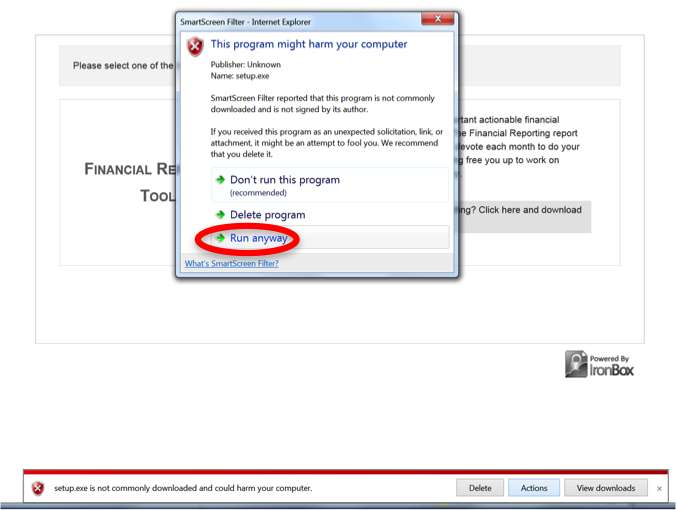 Q: I get warning messages when I install the software – should I be concerned? Q: On my first report, I received a request for my NAICS code – what is that for? Q: How many reports can a veterinary Financial Officer subscriber run each month? Q: How do I know my data and report request were sent? Q: When can I expect my report back? Q: What data is taken from my QuickBooks file? Q: When I prepare to run my second month reports, I see a completely different screen before I upload the data. What is this? Q: Goals, what are they for? Q: It appears that my goals were set on my first report. How was that done? Q: How do I set goals? Q: I cannot get the software to run. What do I do? 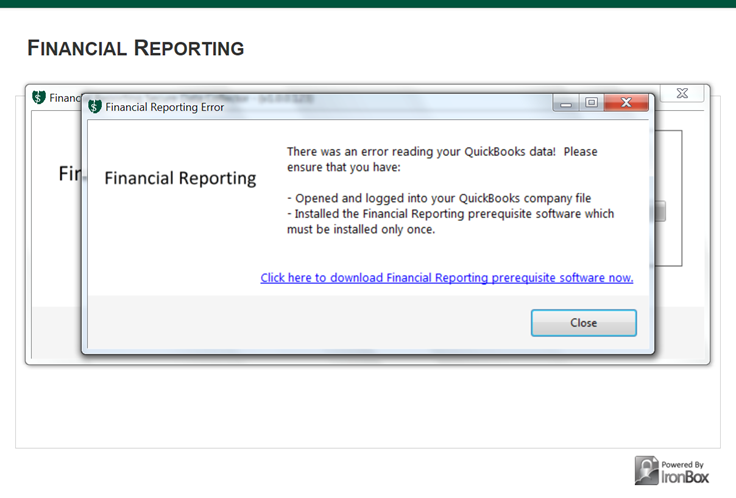 Q: I keep getting the error message stating my QuickBooks are not open and QuickBooks is open. What do I do? Q: I received my first report and I do not get a lot of what it is telling me. Where can I get help? A: veterinary Financial Officer is a new service that provides customized reports from your company’s QuickBooks Financial data – all with just a few clicks of your mouse! Our feedback indicates that it can take 30 hours or more to manually calculate all the Key Performance Metrics and that is time few business owners are able to regularly invest. Now FinancialSoft will provide you with a monthly report identifying areas for potential financial improvement for your company. A: You will need a PC running Windows XP or later, a Desktop copy of QuickBooks with your company’s financial data and Microsoft Internet Explorer as your browser. 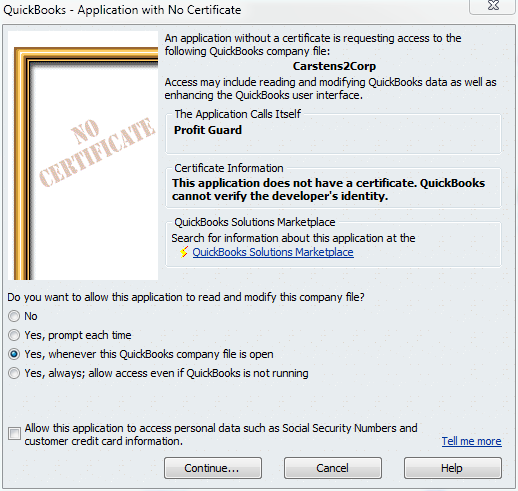 Q: Is QuickBooks for Mac OS X supported? A: All versions of QuickBooks excluding QuickBooks online edition(s). Q: I use QuickBooks “Online” does veterinary Financial Officer support that version? A: Not at the present time. Work is being done to develop a veterinary Financial Officer version for Intuit’s QuickBooks on line products. A: As of today, Intuit’s QuickBooks is the only financial software supported by veterinary Financial Officer. QuickBooks dominates the market at a greater than 80% market share of small and medium sized businesses. FinancialSoft will continue to review other financial software packages for inclusion in veterinary Financial Officer. Q: I am not “financially trained” and have not taken any classes to learn about how my financial statements can help me improve my business results, can I still benefit from getting the veterinary Financial Officer Reporting System? A: The veterinary Financial Officer Reporting System was built to make it easy for people with no financial training to understand and benefit from what their financial statements can tell them. The main requirement to benefit from the FinancialSoft Reporting System is simply that your business use QuickBooks. Each month, when your books have been closed, simply log into your veterinary Financial Officer Reporting System account and get your report. 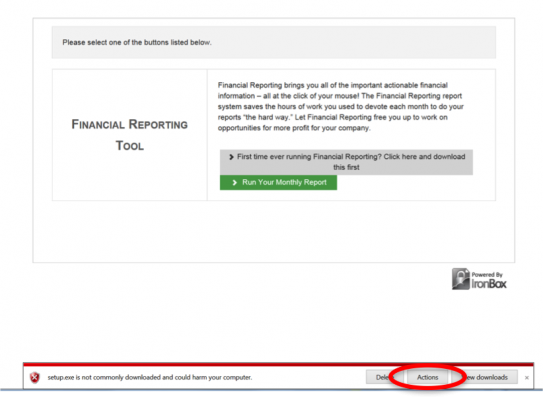 Tutorials: at the bottom of each page in your report you will find a “Tutorial” button. Click on the button and it will open a explanation that explains the entire web page in question. Links: Throughout your report, you will notice (?) icons. Click on these (?) icons for an explanation of that particular term. Videos: The FinancialSoft web site will in the future includes videos that explain much of the report content. 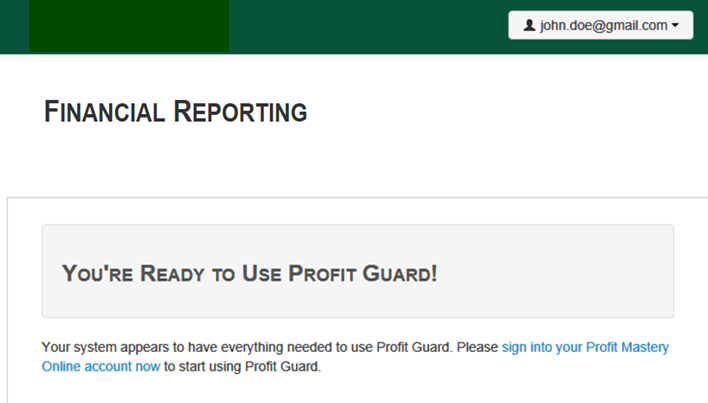 A: Profit Guard was FinancialSoft’s first automated product. Profit Guard was designing in cooperation with Business Resource Services that teaches a financial class called Profit Mastery. All the software that will be on your computer to collect data from your QuickBooks is common to all our Financial Reporting System of which veterinary Financial Officer is one of them. Over time those labels will change to FinancialSoft Financial Reporting System. Rest assured any of these names are correct and will work to veterinary Financial Officer. Q: How do I subscribe to the service? A: You simply CLICK HERE. A: The most successful companies are those that are on top of their financials regularly. Some think Quarterly is enough but in our experience Quarterly is okay for purposes of updating your Investors and Stakeholders. However, to reliably identify and track problems on a timely basis, determine the root cause, incorporate corrective action, and review progress – the process is best done monthly. Best practices suggest prompt action – it does not make sense to wait 90 days to see if your corrective actions are working. veterinary Financial Officer gives you the ability to easily identify opportunities for improvement and modify corrective actions in 30 days to see if the new plan is working – versus 90 plus 90 or essentially a half a year. A: You are downloading an add-on that Internet Explorer uses to process your report request. Specifically you will be downloading two pieces of software: 1) .NET Framework, a software framework to run the second piece of software, and 2) Profit Guard Data Collector. Once downloaded and installed, Profit Guard Data Collector will be accessed through your Internet browser – Microsoft Internet Explorer. A: The North American Industry Classification System or NAICS is used by businesses and the government to classify business establishments according to type of economic activity. We use this code to find comparative data from other business in the same or similar industry type as your company to provide comparable performance metrics. The NAICS data is given as the average 50 percentile, the top 25% or top quartile, and the top 10% – commonly called “best-in-class.” This data will help guide you when setting your goals. Our desire at FinancialSoft is for your business to succeed. If you strive for best-in-class, we are confident you will drive home the financial results you desire. Special note on NAICS Codes: If you do not think the Industry Standards on Scorecard reflect realistic numbers for your business we suggest you look up the NAICS code at http://www.census.gov/eos/www/naics and look at what businesses are with your code. Sometimes the NAICS covers too broad a range of businesses to be as meaningful for your particular business. A: At the end of the process you will see the following window. This assures you that your data was successfully collected and sent to FinancialSoft for processing. A: 48 hours is the turnaround time Monday through Friday. If there is an issue with your report we will contact you at the email or phone number you provided. A: The veterinary Financial Officer Data Collector collects your top level Balance Sheet and Income Statement information for the last 13 months. The veterinary Financial Officer Data Collector does not collect personal information such as credit card numbers, bank account numbers, or social security numbers. To see exactly what veterinary Financial Officer Data Collector sent to Profit Mastery for processing, you can view the collected financial statements after you have run the veterinary Financial Officer Data Collector. Simply check the reports that the veterinary Financial Officer Data Collector ran within your QuickBooks application. A: Data at rest: Your data is encrypted with a unique Advanced Encryption Standard (AES) 256 bit symmetric key with cipher-block-chaining. A second layer of protection using a Rivest Shamir Adleman (RSA) 3072-bit key is also applied. Data protected during transmission: Prior to transmission, your data is first protected using the same process described for protecting your data at rest. During transmission your already encrypted data is further protected with a Secure Sockets Layer (SSL) certificate that uses RSA 2048-bit, AES-128 bit (with cipher-block-chaining) and SHA1 protection. Support for weak SSL algorithms, such as v2.0 and lower, PCT 1.0 and all ciphers utilizing MD5, RC4 or weak key-lengths have been disabled at the host. A: For your first month report, we do not ask you to set goals. To simplify the process, veterinary Financial Officer sets goals for you on the first report by taking your last month’s performance and improving the number by 20%. In some cases it is 20% larger and in others 20% smaller. There is an exception to this 20% standard for Current and Quick Ratio where we set the goal to 1 if you are more than 20% away from 1. Being at less than 1 on the Current and Quick Ratio can be considered a serious problem. We then send that data back to your profile stored on our secure server for use on your next month. 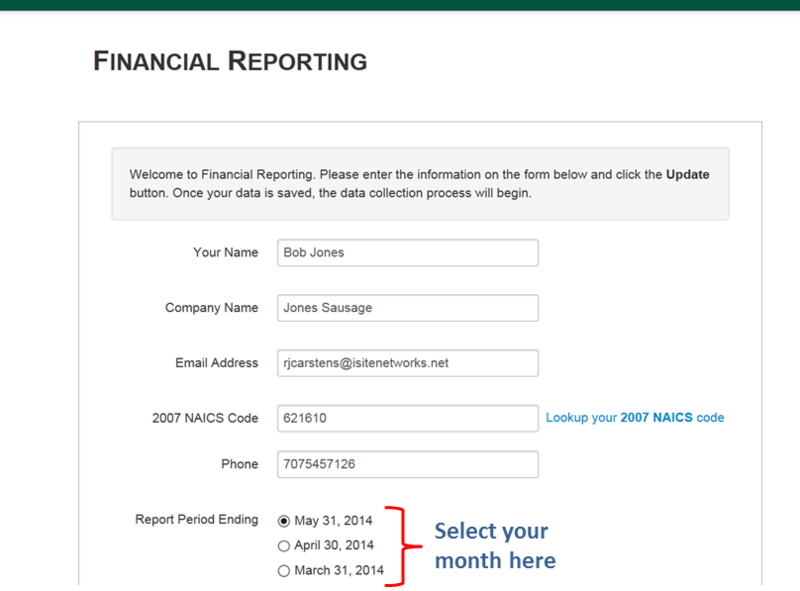 When you enter the system to request your second monthly report, you will see on the window after your select “Run Your Monthly Report,” a table of data. All of the columns include information to help make your decisions on how to set your goals. To set your goals, you simply overwrite the data in the relevant cell. A: It is critical that all businesses have financial improvement goals. The veterinary Financial Officer goals that you set are for the 12 metrics found on the Key Performance Metrics page of your report. The goals are included in the veterinary Financial Officer report processes that identify potential Cash and Profit Impacts relative to your actual performance against your goals. These impacts will be shown on the Key Performance Metrics and Financial Flow pages of the report. 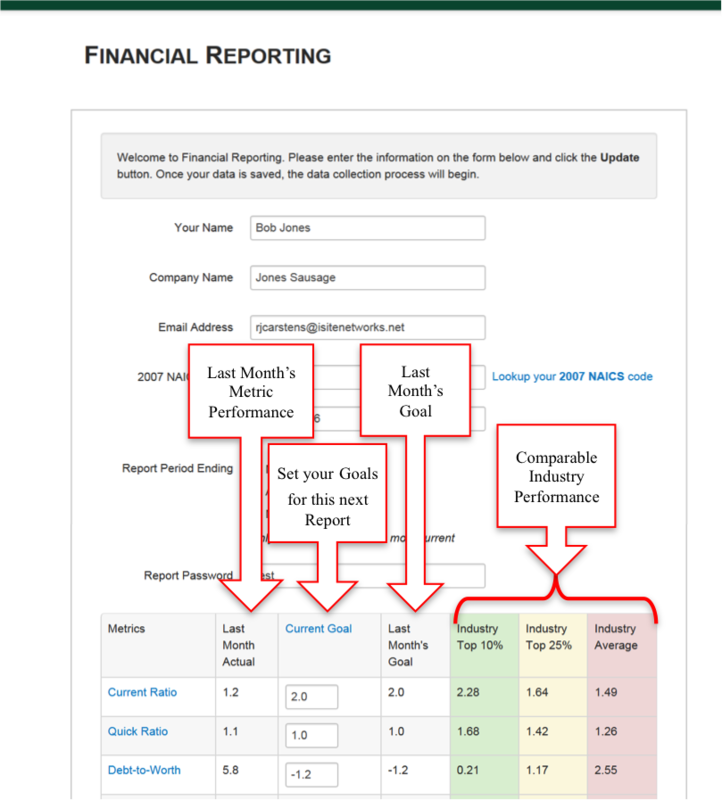 A: For the first report that you request for your company, the goals are automatically set for you at the top 10% of your industry peers based on the NAICS code you provided. This should be your ultimate goal to be “Best-in-Class” in your industry. 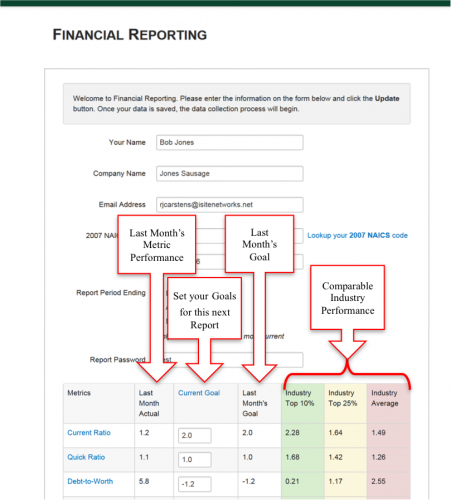 When you see your first report it will show you realistic potential for your business. a) If you are below the Average 50%, set your goal at the industry standard of 50%. b) If you are better than the Average 50%, but lower than the Top 25%, set your goal at the Top 25%. c) If you are better than the Top 25%, but less than the Top 10%, set you goal at the Top 10%. a) 10% better than the best of the last 3 months. b) Equal to the best you have done over the last 13 months. c) 10% better than the best you have done over the last 13 months. A: We have a diagnostics tool built into veterinary Financial Officer that will determine if you have all the software required to run veterinary Financial Officer. This tool can be found when you are logged into your veterinary Financial Officer account under your name. 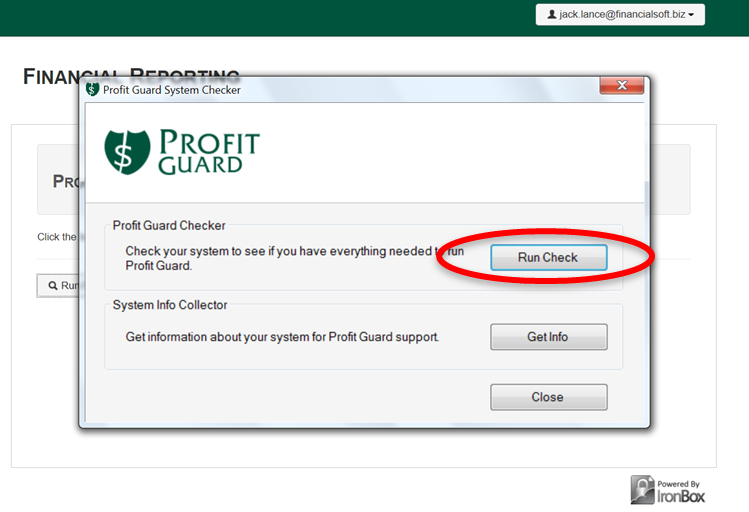 Select your User ID in the upper right corner of the browser, then Help then Profit Guard System Check. This will be your next screen. 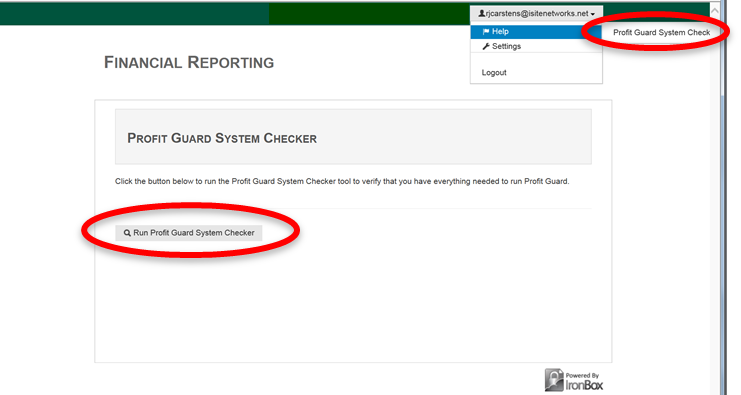 Select Run Profit Guard Reporting Tool System Checker. This will be your next screen. Select Run Check. 1) On the very first report for a company file, the QuickBooks administrator for that company file must open the company file. Only the administrator can allow an external program to connect with QuickBooks. If you are logged into QuickBooks as the administrator you will get the following screen from QuickBooks: Select “Yes whenever the QuickBooks company file is open” as shown below. 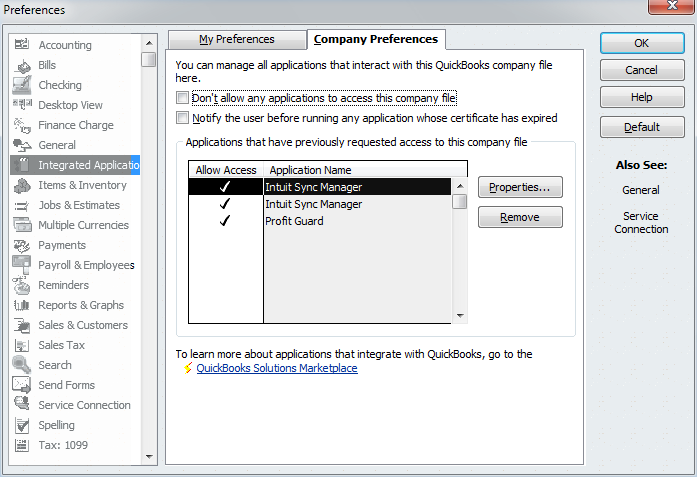 2) If the prior screen does not show up in QuickBooks, the Preferences to allow an external application from communicating with QuickBooks is most likely turned off. Q: I received my first report and I do not get a of what it is telling me. Where can I get help? A: There are several areas you can get help. 1) We have downloadable pdf explanations for each page of the veterinary Financial Officer Report. Check the pdf links at the bottom of each page of the report.